It’s getting to that loved up time of year again. Valentine’s Day is a few short weeks away and florists are preparing for one of the busiest days of the year. If you are normally rushing on the way home from work, you’ll probably still find a florist open as they tend to stay open later on busy days, but you might not find much left to choose from. All good florists will have Valentines flowers on their website to choose from now. The easiest way to organise flowers is to have them delivered, all you have to do is pick what you want and order them, job done. This will probably get you the most brownie points too, especially if you have flowers delivered to your partner’s workplace, everyone secretly loves to receive flowers in front of their colleagues. If you want something more individual you can phone the florist and ask for their advice. Florists stock all the usual flowers at Valentines Day as well as plenty of red roses. But don’t automatically think you have to go down the red roses route. It’s true red roses cost more during Valentines week than the rest of the year, because the whole world wants them that day, the price at the auction goes up. 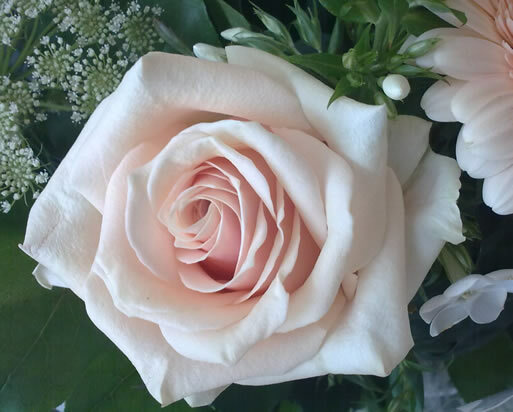 Florists usually stock lots of different coloured roses around Valentine’s Day, why not pick a bouquet of roses in your partners favourite colour. Other colours of roses usually cost a bit less than red roses too at Valentine’s Day. There are so many other options available, think about what your loved one would like to receive. Do they like roses? not everyone does. Most people have a favourite flower, it is far more personal to receive a bouquet of your favourite flowers and it shows more thought has gone into your gift. If you are stuck for ideas ask the florist, they will be more than happy to tell you what pretties they will be stocking that week. 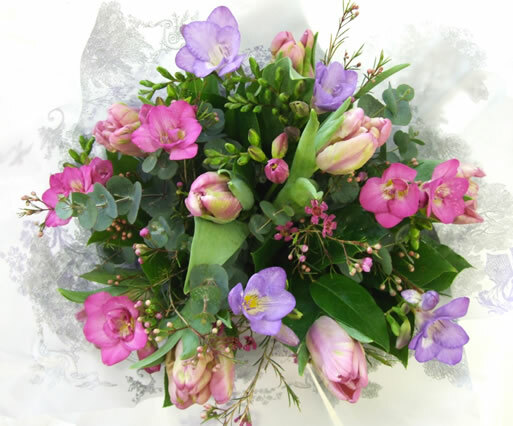 Seasonal flowers are always fabulous quality and Valentines Day is perfect for spring flowers, plus they smell gorgeous. A mixed bouquet with a single velvety red rose in the centre is another favourite. Beware the last minute supermarket dash on Valentine’s Day. You might think you can pick up something for dinner and a bunch of flowers at the same time. Big mistake, supermarket flowers will not compare to a florists bouquet, most often squashed together in a bit of clear plastic. They may be a bit cheaper but will definitely look it and your loved one will know they required all of two seconds thought. Even the posh supermarkets don’t cut it for flowers at Christmas and Valentine’s Day, their flowers will cost the same as a florist but the quality grade will be lower and the stems a lot shorter. Last year I told you how the length of flowers relates to the quality. If you only have two minutes spare to sort your valentines flowers, phone your local florist, ask for a bouquet to be made to your budget and collect it on the way home. Infinitely better than a sad supermarket bunch.